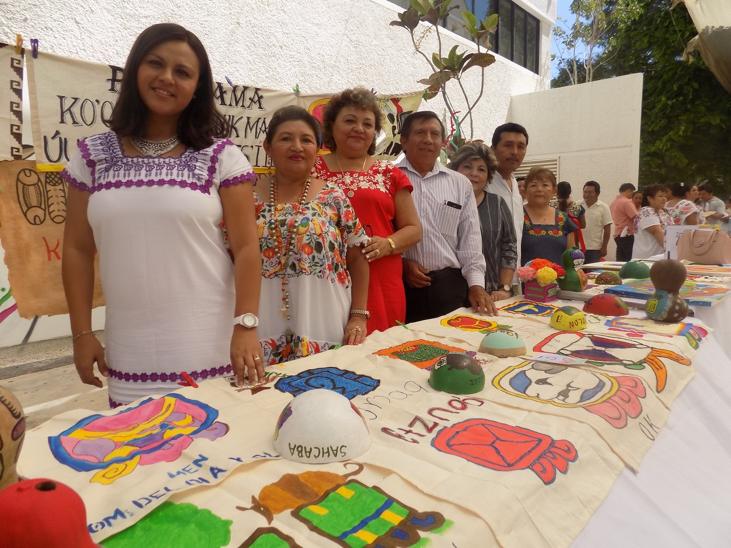 Activity 1: On March 24, 2017, as part of the activities to celebrate the International Day of Mother tongues, a Mayan language reading marathon and hieroglyphic writing exhibition were organized, with the name “Yáax múuch’ xookil ich maaya t’aan yéetel u ye’esajil úuchben maaya ts’íib.” Its main purpose was to promote the reading in Mayan language and the ancient writing of our grandparents, sharing the works that the members of the group have done in different workshops on glyphs. 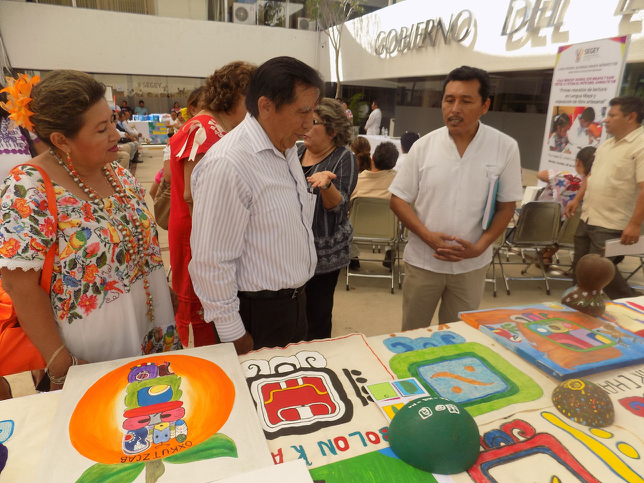 This event was held in the Esplanade of the Secretariat of Education of Yucatan from 9 am to 12 pm, and was attended by 200 teachers of Primary, Preschool and Initial Bilingual schools, 43 School Supervisors, 6 Heads of Education Region Indigenous, authorities of the Ministry of Education, as well as parents, students and the general public. 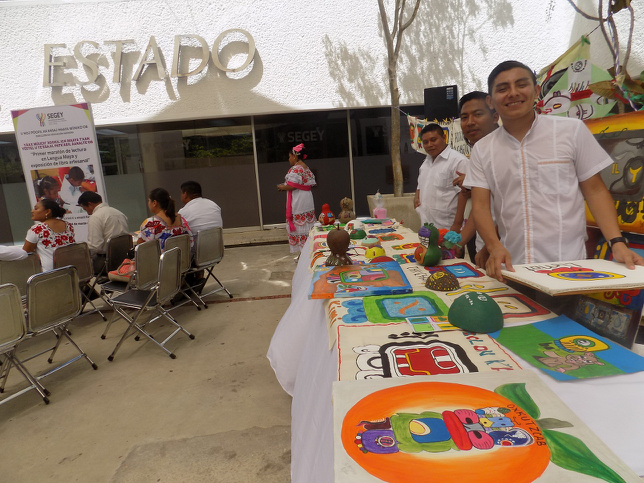 As part of the event, exhibition tables were set up for the works with glyphs made of different materials such as cloth, bond paper, cardboard, wood, and objects commonly used by the inhabitants of the state, such as jícaras, calabazos, and lekes, fruits from the Maya area. Once dried, they are adapted as containers to drink water or consume food. With these materials and products, paintings, napkins, centerpieces and other handicrafts or decorative elements were made. The texts written with glyphs on those carriers were names of people, names of towns of origin of the participants, the glyphs of the tzolkin calendar, as well as the nawales of the participants. 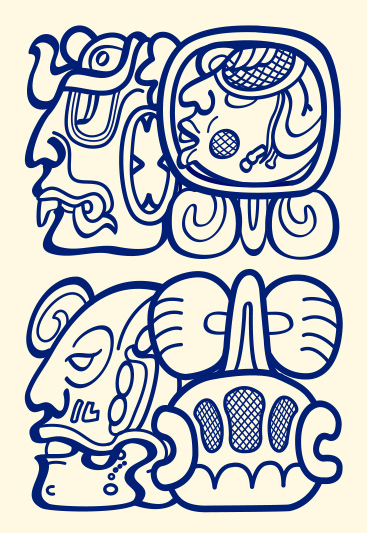 In total, 53 different products with Mayan hieroglyphic writing were exhibited. Information was given about the objects’ preparation and support was offered to the participants learning to read glyphs, who were also taught how to use the syllabary to write short words. 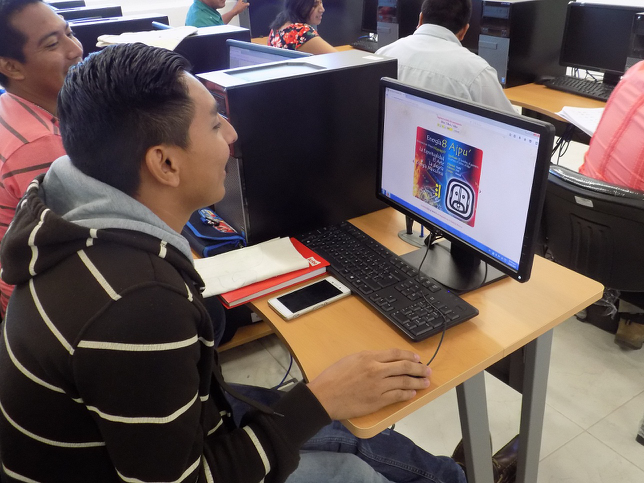 For the Mayan language reading marathon, 38 readers from the different Indigenous Education School Zones participated. 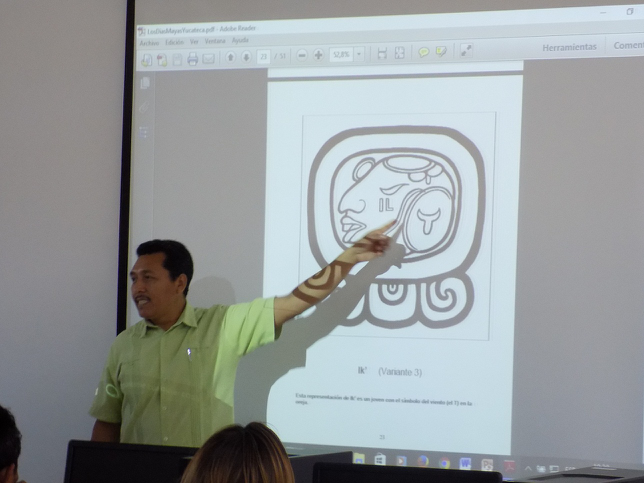 The activity ended with Feliciano Sánchez Chan, a well-known writer in the Mayan language in our state, who read some of his own texts for the event. 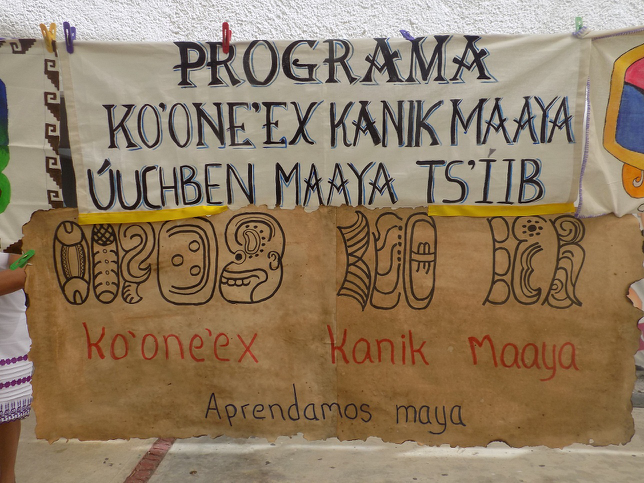 Activity 2: On March 30, 2017, a new workshop on Mayan glyphs was held for the Ko’one’ex Kanik Maaya Program, to further the group’s training on Mayan hieroglyphic writing and continue with their teaching. This activity was carried out in the computer room of the Common Use Building of the Ministry of Education, from 9 a.m. to 2 p.m. and was attended by the 25 members of the group. First we took attendance, after which participants were given a snack with refreshments, coffee and cookies considering that some came from remote communities and had to travel from dawn to arrive at the set time. The purpose of this workshop was to reinforce the group’s knowledge about the tzolkin calendar and to learn what a nawal is and how to determine the nawals of each participant. -We began with a group activity, a game where questions were asked of the participants to remind them of what they know about the Mayan ha’ab and tzolkin calendars: their characteristics, the days that make up each one, their function, the names of the days of the tzolkin calendar and the way they relate to the 13 numerals to integrate the 260 days of this ritual calendar. -As a second activity, we discussed the 20 glyphs of the tzolkin, using a PowerPoint presentation, to reinforce the meaning of each glyph or the element it represents. A dynamic discussion encouraged learning the 20 names of the glyphs. 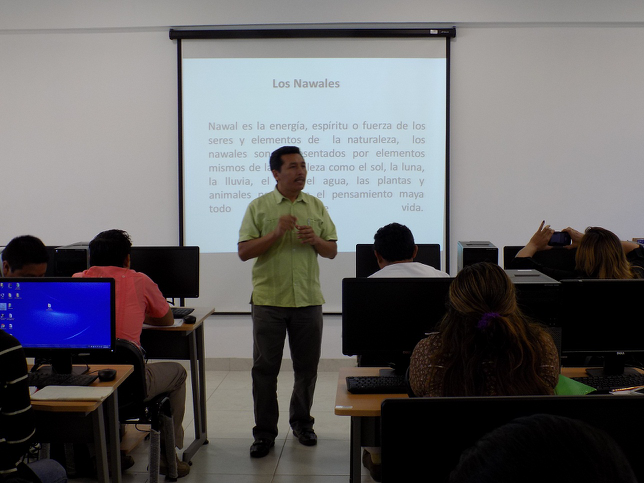 -As a third activity, participants were given an explanation of the concept of the nawales, how they are determined and the function they fulfill from the perspective of Maya culture. It was concluded that in Maya thought the nawal is the spirit, energy or force of the beings and the elements of nature, and that all people have one that represents us and that defines the characteristics of our personality as an individual. -After that, they were presented with an online program called “Calculate your Nawal Q’ij” on the Mayan wisdom page (sabiduriamaya.org), which allows a person to know his or her nawal by entering the date of his or her birth according to the Gregorian calendar; the procedure to use it was explained to them and a group completed the exercise. -After each participant was assigned a computer with internet, they were asked to enter the page and identify their nawal and read the accompanying text that describes their personality, analyzing if it really corresponds to their person. Finally, each participant shared his or her protective nawal, along with the numeral and conclusions of the analysis of the text about his or her personality. Most agreed that what they read describes what they are really like as people. 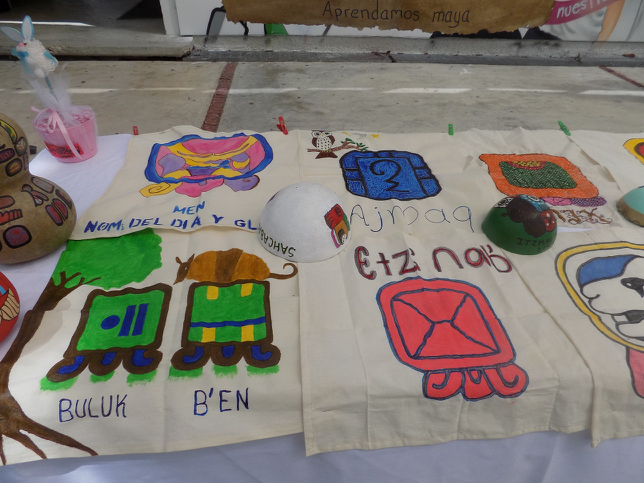 As a last activity, participants were given pieces of raw blanket fabric (0.50 x 0.50), textile paint in various colors and brushes; they were instructed to make an artistic design of their nawal. At 2:00 in the afternoon the work day ended, leaving us to present the artistic designs in the next session. 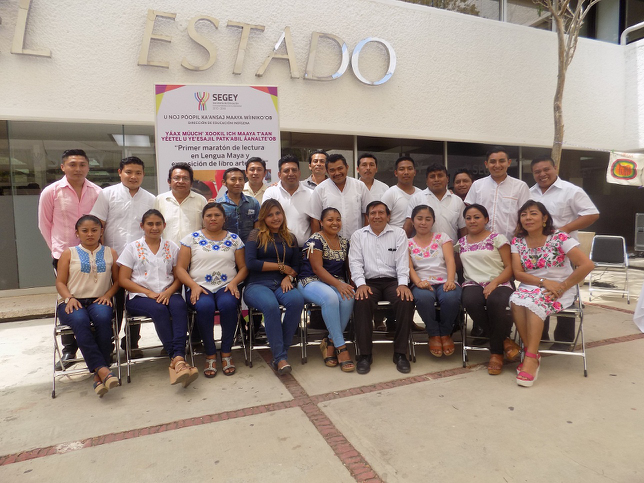 As a commitment, it was agreed that what participants learned in this work session will be put into practice with their students, just as they have done in previous workshops. Finally, a box lunch was provided to each of the participants, considering that most had to make a long trip back to their community. Profr. Milner Rolando Pacab Alcocer. Hello from Chicago Illinois, united States of America.